School rules with this 18-inch boy doll! Studying the ABCs of style! 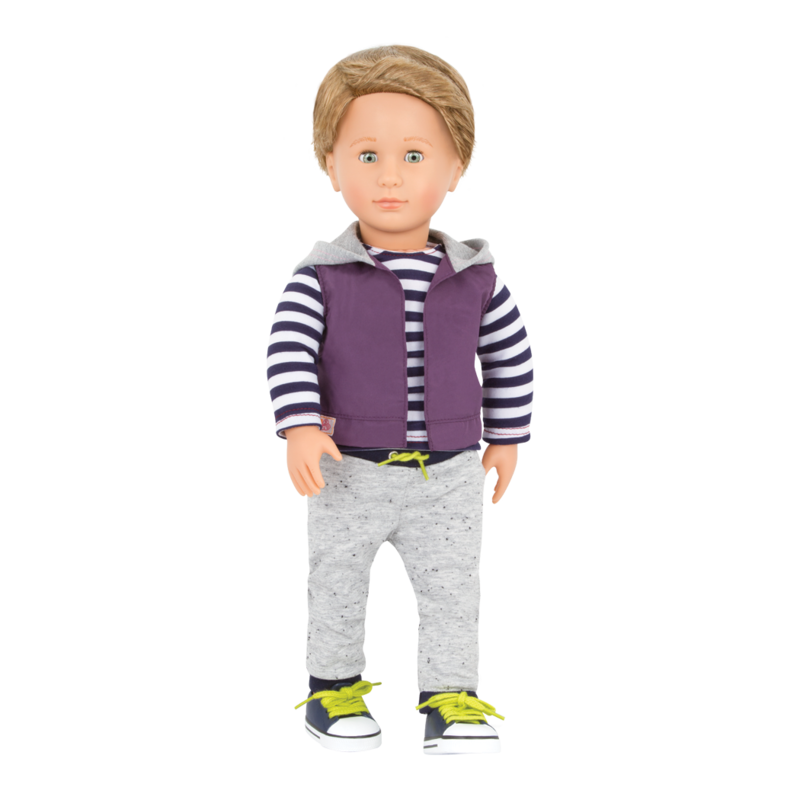 It’s not always easy for a little boy to be the new kid in school, but making new friends will be easy with Our Generation Regular 18-inch School Doll – Rafael, a cool boy doll who has short, light-brown hair and pale green eyes. Looking cool for back to school! Rafael is a non-posable doll whose neck, shoulders, and hips rotate so he can be positioned in many different ways! Rafael wears a stylin’ outfit with a cool purple hooded vest, striped black-and-white long sleeved t-shirt, comfy gray sweatpants, and black high-top sneakers with real laces. These 18-inch boy doll clothes can be mixed and matched with other pieces from the range of Our Generation outfits, particularly the athletic outfits. What will you learn with Rafael today? All of the Our Generation dolls LOVE school, just like Rafael! 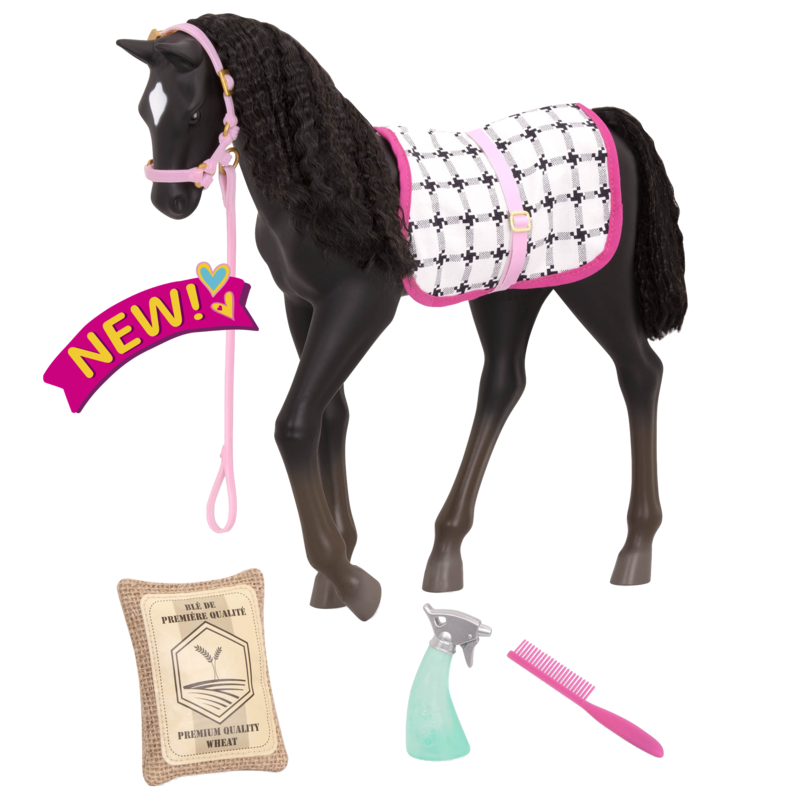 You can teach them all kinds of things at the Awesome Academy, a school room accessory set for 18-inch dolls that has everything you need, even a working school bell! Rafael likes to have comfortable and cool outfits to wear to school. Dress him in the Campfire Cutie outfit, the Free Style outfit, or the Fall for Volleyball outfit. Rafael loves exploring the oceanside and doing fun water sports like surfing! He can drive along the coast to explore the water with the OG Off-Roader which even has a working radio! Rafael has a cool hairstyle that reminds him of his big brother. It's a modern, skateboarder-style cut with a side part that is a little longer in the front so that he can flip his bangs to the side. So cool! While he is travelling all the way to you, Rafael doesn't want his hair to get messy, so he puts a LOT of hair gel in it to keep it in place. To loosen up Rafael's hair and remove the gel, you can simply rub small sections of hair gently between your fingers, or use a brush to gently brush it out. Make sure to avoid heat and styling products on your doll's hair (and body)! Heated styling tools like hair dryers or straighteners and products like gels or mousses can permanently damage your doll. I love how your company makes boy OG dolls, but could you please make a deluxe boy doll? Maybe a skateboarder or a video gamer? And please, please, please make boy doll clothes! It isn’t fun to have a boy doll that doesn’t have any clothes besides the clothes he came with! I just bought two of this same doll because my sons wanted to play with my daughter and her friends. I am happy to find a boy doll, but its still disappointing how few options there are. I’m making a few outfits because I sew, but all of the accessories that you sell are so pink and girly. Some girls don’t like pink, some boys don’t like pink. And Rafael surely deserves to have some clothing and furniture options! Hi Melissa! We’re so glad that you love your Rafael doll! While there isn’t a line of boy outfits yet, there are a few outfits that can work for Our Generation boy dolls (and of course the clothing can be mixed and matched between sets): Karate Kicks, fall for Volleyball, Campfire Cutie, Gotta Bowl, Hole in One, Cozy Camper, Winning Track, Fashion on Board, Free Style, Nature Lover, and Hit a Homerun. We hope this helps, and have fun playing with Rafael! Thank you for these affordable dolls. My jaw dropped at the prices of those American Girl dolls. Yikes!! I can’t wait for Christmas to buy her more dolls and sets! Thanks again! Hey og company, I just want to tell you that not all the18 inch dolls are here. Either they are retired or the dolls are not important? I just want to know but the dolls are cute. Hello! Yes it’s true, our website does not always show all of the dolls or other OG products we make. We are working on updating it all the time, but with so many super fun toys to write about, it’s a BIG job! If you check back every few weeks, we will continue adding new products and fun new content. Some of the older dolls that are no longer being sold might not make it on the website, but we know that there are lots of fans out there who love those dolls, too, so we are busy brainstorming ways that we can continue to share those products with you. Thanks so much for your feedback and for being a fan of Our Generation! I love this doll he is going on my birthday wish list ! Nice Move Our Generation ! He wanted one he could play with us girl good job on starting to make boy dolls and realising that no just girls play with dolls and that we might just want boy dolls to play with😀 Although there are no boy clothes yet so he has no choice but to wear the Same clothes every day. So my request is that if you have not already started making boy clothes and accessories to make some…. We’re so glad you like Rafael! You’re right, dolls are not just for girls and we’re happy that you are having fun together. 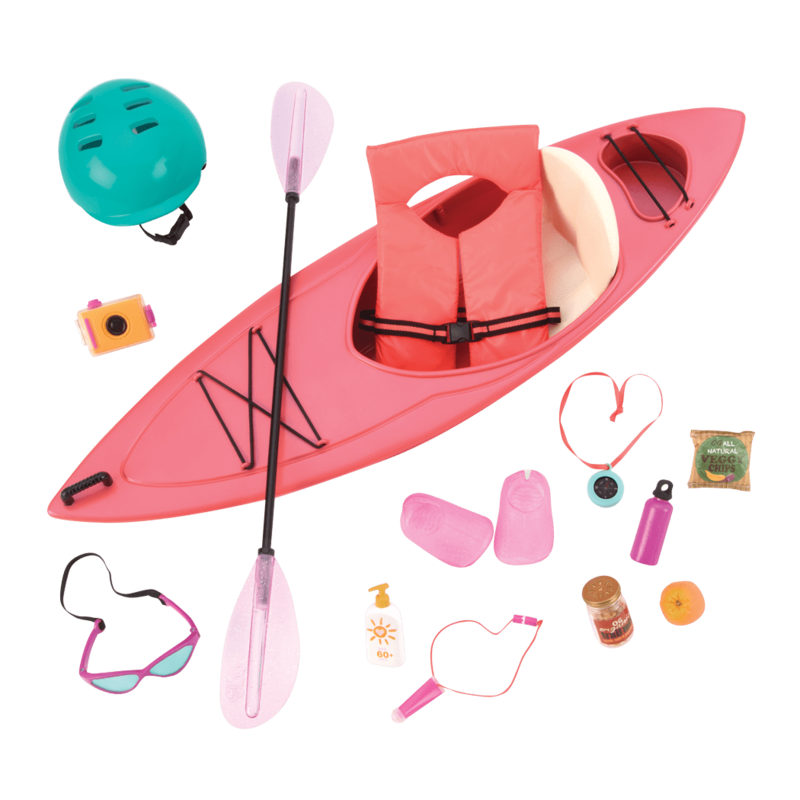 For the moment we do not have a specific line of boy clothing, but did you know that there are a few outfits in our collection that will work for boy dolls, such as Free Style, Karate Kicks, Fall for Volleyball, and Campfire Cutie? You can find these outfits under the Athletic outfits label here on our website. Have fun playing!